Angie’s Curse will perform with Dead of Night, The Vigils and Seeing Red at Emilio & Alicia’s 9th Annual Halloween Costume Party! 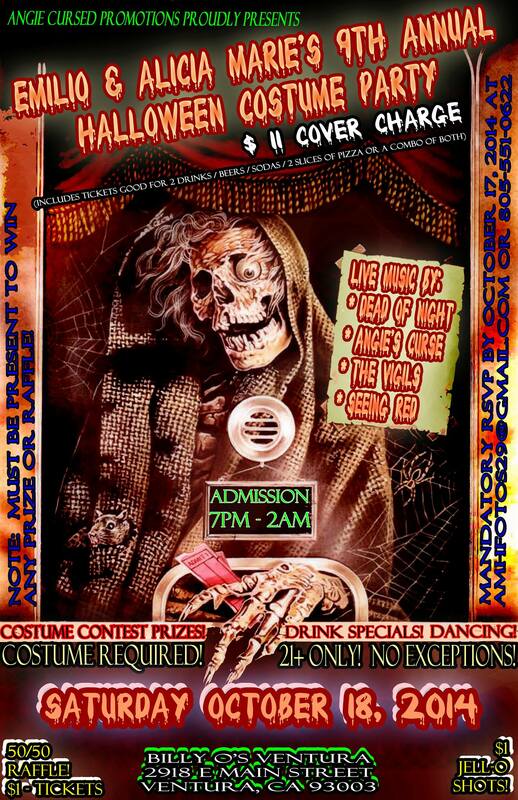 Angie’s Curse will rock the stage with local favorite, Dead of Night, LA’s newest up and coming band, The Vigils as well as Seeing Red at Emilio & Alicia Marie’s 9th Annual Halloween Costume Party. Angie’s Curse has played every year for the past 9 years and the tradition shall continue this year at Billy O’s Restaurant & Saloon, 2819 E Main St, Ventura, California 93003 – Save the date! Oct. 18th – 7:00pm – Sunday, October 19 at 2:00am. COSTUMES ARE MANDATORY! Cover charge will pay not only for the food, drinks, but also for the 4 bands and all the prizes and the raffle. We will have 3 Halloween Costume CASH prizes, and a 50/50 cash raffle. DJ Darko shall spin some tunes for a huge variety of dance music as well as E and A’s Halloween Party playlist. INVITE as many friends you would like to attend. Advanced purchase for $11 Cover Charge and/or $1 – 50/50 Raffle Tickets can be pre-purchased via PayPal. Send your email address to amhfotos29@gmail.com with the names of the guest to attend and the quantity of entrance(s) you would like to purchase and/or $1 raffle tickets and I will send you a PayPal Request. NOTE: $2 service fee will be added to your total for using this option but if you pre-purchase your tickets before October 10, 2013 you will earn two free Jell-O Shots.